That is the end of our coverage of the North West 200 road races. An extremely sad note on which to finish. A rider has died as a result of an accident during the Supertwin race. North West 200 officials say racing has been cancelled. Racing will not resume until at least 4.15. Still awaiting news of the incident which led to the Supertwin race being halted. There will be a further delay until 3.45pm following the red flag incident in the Supertwins race at the Vauxhall International North West 200. Ian Hutchinson won the first Superstock race and will be looking for a repeat success as the second one is up next at 3.30.Image caption: Ian Hutchinson won the first Superstock race and will be looking for a repeat success as the second one is up next at 3.30. Following a crash on the approach to Black Hill, the Supertwins race has been red-flagged. There will be a 30-minute delay. The race has been declared a result. So Lintin wins both Supertwin races at the NW200, with neither going the full distance.Image caption: So Lintin wins both Supertwin races at the NW200, with neither going the full distance. This will be declared a result as three laps had been completed, so victory goes to 31-year-old Lintin from Bardney in Lincolnshire. Martin Jessopp is runner-up with 52-year-old Jeremy McWilliams in third. Then come James Cowton, Michael Sweeney and Darren James. Lintin sets a lap record and looks on course for his second win at the North West, having been declared official winner of Thursday's curtailed Supertwin race. Second-placed Jessopp is pulling away from Malachi Mitchell Thomas who would love to land a podium berth on his North West debut. That would be quite achievement for the 20-year-old from Lancashire. But there is another red flag and the Supertwin action comes to a halt. An English 1-2-3 on the first lap as Ivan Lintin leads from Martin Jessopp and Malachi Mitchell Thomas. Next are 52-year-old Jeremy McWilliams and James Cowton. They're away for the four-lap Supertwin race. This is the slowest class, but these guys will still be getting up to 165mph. Next up is the Supertwin race, the class in which Ryan Farquhar is undoubtedly the leading light. 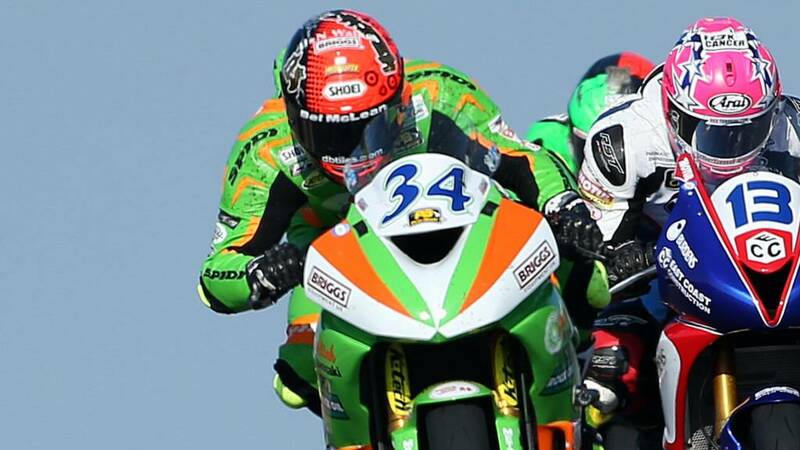 Farquhar is in hospital in Belfast after crashing during Thursday night's racing, and was described as being seriously ill. His KMR team said he had a successful operation and doctors were happy with the progress he was making. Joining Dunlop on the Superbike podium are runner-up Ian Hutchinson and third-placed Michael Rutter. An amazing 27th podium place for 44-year-old Rutter. Following them are Peter Hickman, Lee Johnston, John McGuinness, Conor Cummins and Alastair Seeley. The positions are declared as the result with four laps having been completed, so Dunlop makes it five wins in his North West 200 career. One victory ahead of big brother William now. Ballymoney man Dunlop has established a good gap at the front on his BMW as he aims to add to his four career wins at the North West. The 27-year-old sets a lap record of 123.207. Hutchinson and Rutter next, but Anstey seems to have hit problems. The race is red-flagged as Anstey comes off his Honda machine. Happily the popular Kiwi is OK.
Michael Dunlop is a man on a mission, hitting the front. Next comes Anstey, Ian Hutchinson, Michael Rutter, Peter Hickman, Lee Johnston, John McGuinness and Conor Cummins.